Japanese Knotweed (Fallopia Japonica, Renoutria Japonica or Polygonum Cuspidatum) was first introduced into the United Kingdom in 1825, when it was purposely planted in Kew Gardens. It was also later used as an ornamental garden plant in parks and recreational areas and as a food source for grazing animals. 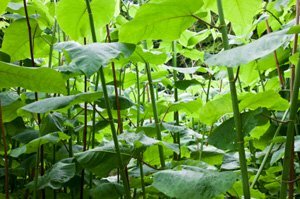 Under The Wildlife and Countryside Act 1981 Japanese Knotweed is now a controlled species and, as such, soil contaminated with its rhizomes must be disposed of appropriately and it is an offence to allow it to spread to other land. Stem injection targets the application of a controlled quantity of herbicide directly into the core of the plant between the second and third nodule. This direct targeting of the herbicidal application enables stem injection to be the least insidious method of eradication of Japanese Knotweed. The stem injection is normally undertaken when the plant is dying back as it then draws the Herbicide into the root system. Unlike traditional spraying methods, the injection system is not weather dependant i.e heavy winds or rain. Stem injection can 100% be safely applied in an area where Tree Preservation Orders have been issued and where there are environmental constraints. Stem injection has no impact on any surrounding vegetation or wildlife. Stem injection is accepted and authorised by the E.A. to use on organic approved farms, without causing the loss of their organic status. Due to the labour intensiveness of stem injecting it is really on used on smaller sites or sites that carry environmental constraints such as water courses and or tree preservation orders. This is perfect for large infested sites that have no environmental constraints. The Herbicide is applied directly to the plant and absorbed through the leaf and into the rhizome. Knapsack applications are dependent on weather conditions. All Herbicide applications are carried out ‘in-house’ by our NTPC PA1 & PA6 qualified staff. To eradicate this invasive plant requires an understanding of its growth and legislation. Please contact Integrated Pest Management Ltd for a further details or a free site survey on 01992 763 776.